This boys' slim fitting grey suit is a single breasted classic 2 button jacket with shawl lapels, outer flaps for the lower pockets and the chest pocket is designed for a pocket square. The jacket has double vents in the back jacket in sizes 8 and up. The smaller sizes only have one vent in the back. Trousers do have belt loops and are crafted with an enhanced waist band with sizing slides on bigger sizes whereas the smaller sizes have elastic sides. All sizes have a fly front for easier comfort. Trousers also feature finished hemline which is designed for very easy hemming if needed. Matching button front vest is include and fully lined. Pre-tied suit tie is also included. Included is a traditional long sleeve; lay-down collar white shirt made of 35% cotton, 65% polyester fabric. This suit is available in sizes from 2 Toddlers to Young Men Size 18. Refer to Tuxgear's size chart available in photo section. This beautiful slim fitting suit is in stock and ready to ship! 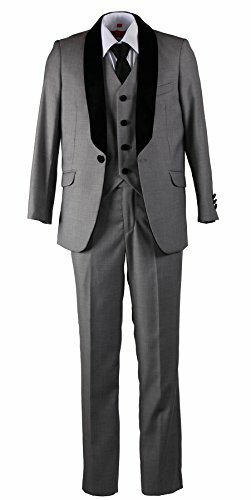 Boys 5 Piece Slim Fit Grey Suit - Shawl Collar Grey Jacket with Velvet Lapel, Pants, & Vest, Black Suit Tie with White Classic Dress Shirt - Toddlers to Boys' Sizes - Crafted by BJK Collection. Slim Fit Suit is available in sizes 2 Toddlers, 3 Toddlers, 4 Boys, 5 Boys, 6 Boys, 7 Boys, 8 Boys, 10 Boys, 12 Boys, 14 Boys, 16 Boys, and 18 Boys. Refer to Tuxgear's Size Chart located in Photo Section. 65% Polyester 35% Viscose for the Jacket, Pant, Vest & Tie. Polyester-Cotton Blend Shirt. Elegant satin lining inside jacket see pictures for details.